← Should I Buy a New or Older Home? 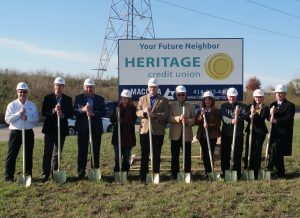 Heritage Credit Union has officially broken ground for its new location in Machesney Park, Ill. A ceremony was held on October 25, 2017, with several community members and village officials in attendance. When the new full-service location at 7144 North Perryville Road opens next spring, it will provide a full range of consumer financial services, including deposit products, loans, mortgages and financial counseling. Heritage has served the residents of northern Illinois since 1988, and currently assists members at its Rockford branch located at 5959 East State Street. The addition of the new location will provide greater convenience and personalized service to residents of Machesney Park and the surrounding communities. For additional information call 888-432-8496. Photo Caption: On October 25, 2017, Machesney Park officials joined members of the Heritage Credit Union board of directors and executive team to break ground for its new location at 7144 North Perryville Road. Construction on the building is set to begin in early November and be completed next spring. This entry was posted in Heritage Updates. Bookmark the permalink.